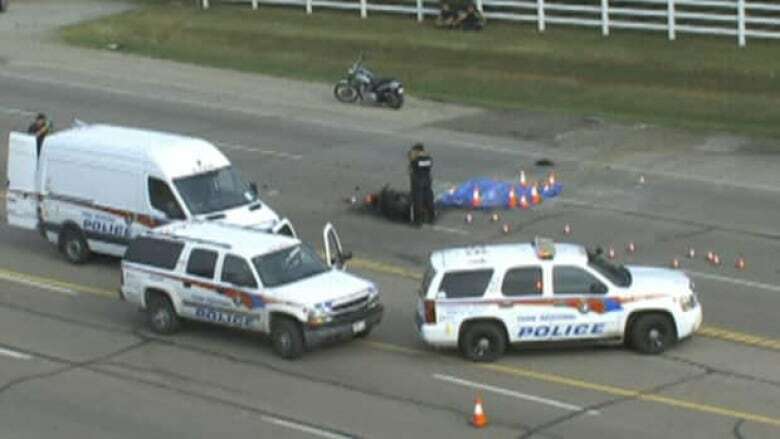 An off-duty Toronto police officer was killed in a motorcycle crash on Highway 7 Tuesday afternoon. Const. Riccardo Torchia, 30 and from Vaughan, was driving a motorcycle when it collided with a dump truck close to Highway 50 around 2 p.m, closing down Highway 7 between Highway 50 and the 427 for several hours. The Toronto police officer had been working out of 23 Division, and served on the force for about two-and-a-half years. The collision was reported to York Regional Police after a dump truck travelling on Highway 7 was crossing over to make a turn into a driveway. A motorcycle travelling in the eastbound lanes was unable to stop in time and struck the dump truck, bursting into flames. "There were reports of flames," said Sgt. Laurie Perks, with York Regional Police. "There were were reports of flames, and with thanks to our friends from Peel Region, who we border with here, one of their officers was first on scene and did attempt to exinguish the fire, and so I understand that did take place before the fire department was arriving." Mike McCormack, president of the Toronto Police Association, said Torchia's colleagues at 23 Division were in shock. "He was 30 years old. He had only been on the job for two-and-a-half years," McCormack said. "He was a great officer and he was coming along well in his career." McCormack says Torchia's family and steady girlfriend were devastated, and that the Toronto Police Service will do what it can to support them.